I was contemplating getting my hands on a snowman die and thinking that really I ought to resist when into my head popped a memory that I actually had one somewhere, but where. The die I'm talking about was a very early Spellbinders one (I'd say probably from more than 10-12 years ago) from when die cutting at home was in its infancy, as was card making if we think about it. The die came in a CD case and was a square of metal with all the various parts for cutting just holes, with cutting edges obviously but this format does make it a bit more difficult to cut out pieces in different colours - so much easier when each shape nowadays is usually a separate die, however small. I knew this die wasn't amongst my current storage system but a search proved fruitful so there will be no need for me to spend out for a snowman. This was a box I'd not looked in for absolutely ages and of course I rediscovered various other quite old dies, mostly of the thicker type with foam attached (not the really thick Sizzix Bigz ones - I know where they are and use them). In the main they were Cuttlebug ones and I'm not sure they even produce dies nowadays although of course they still sell their machines. Anyway onto the card - I cut out and assembled the components for the snowman and also die cut some trees and a curved snowscape onto which I stamped the sentiment - aided by the Misti of course. 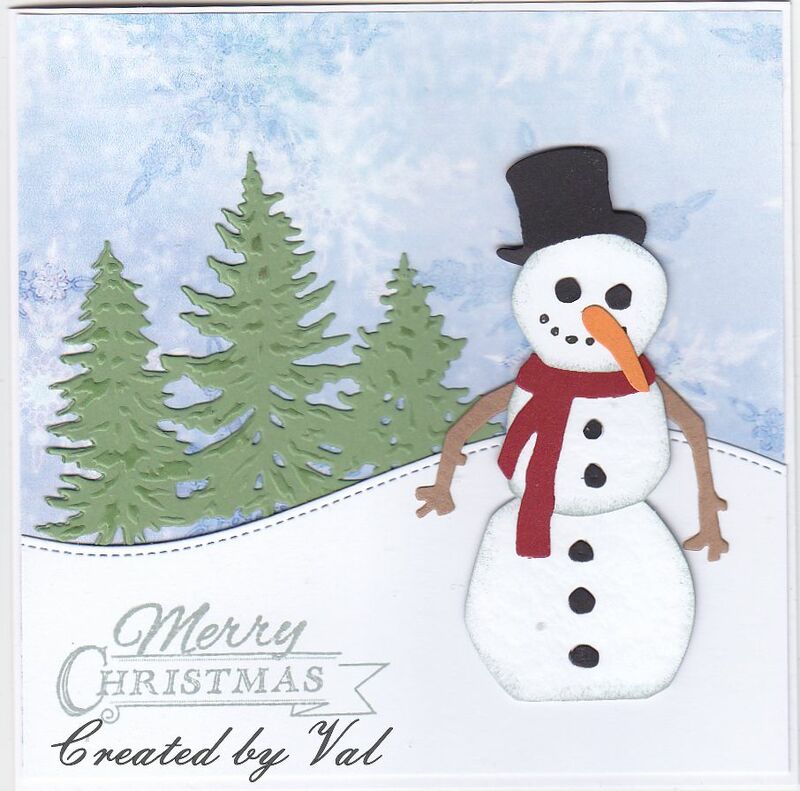 A piece of snowflake paper left from a previous project and now I have another card for the Christmas collection this year. Now if only I could think like you Val, and go find the old die instead of buying a new each year (LOL). A fantastic card and you would not know that the die was not new.